Stained glass windows from St. Bede Church in Holland, Bucks County, were installed at St. Francis of Assisi Parish in Greenwood, Miss. A distance of more than 1,100 miles separates the suburban sprawl of Holland in Bucks County from the Mississippi delta town of Greenwood. But the simple act of giving has connected the two communities, and the churches that serve them. Both Franciscan Fathers Gregory Plata and William Stout understand the chasm, in both demographics and miles. The pastor and assistant pastor of St. Francis of Assisi Parish in Greenwood came from the working class neighborhood of Parkwood in Northeast Philadelphia, and attended St. Anselm Elementary and Archbishop Ryan High Schools. But 10 years in the delta has given them a new understanding of people in need, both physically and spiritually. “Greenwood is the poorest county in the poorest state in the United States,” said Father Plata, who has also served in Chicago and Milwaukee. His statement is proven by U.S. Census figures which show that 36.5 percent of all Greenwood residents live below the poverty line, compared to just five percent in Bucks County. Four years ago Father Plata came to Holland to celebrate the wedding for the daughter of a close friend, St. Bede parishioner William Rodgers. On meeting the then-new pastor, Msgr. John C. Marine, they started a conversation regarding the monsignor’s plans to renovate the church with different religious icons, including stained glass windows. 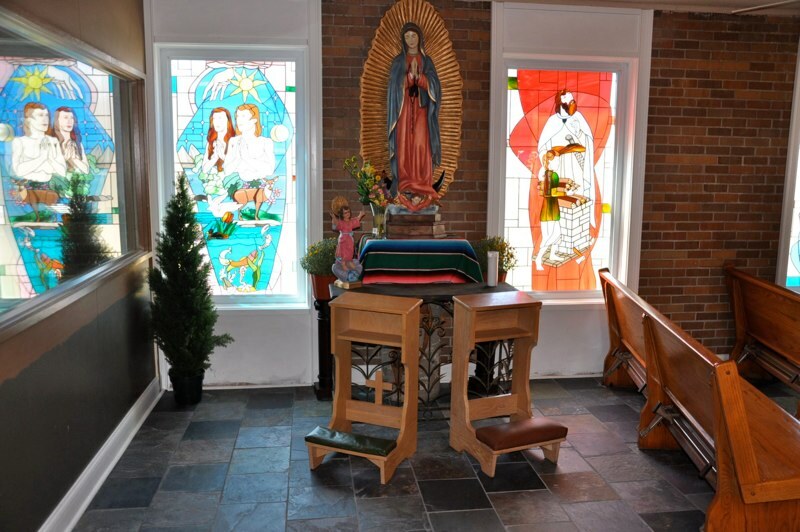 At that time, St. Bede the Venerable Parish was engaged in an extensive renovation project, which involved re-using furnishings, religious relics and stained glass windows from the recently closed Most Blessed Sacrament Parish in West Philadelphia. The windows from St. Bede’s suddenly became available. Father Plata was also in the middle of a church facelift of St. Francis Church, and was surprised by Msgr. Marine’s phone call. The windows were secured, but there was still the logistical problem of loading and transporting them to Mississippi. Providence once again stepped in, courtesy of a cotton farmer. The farmer was in the process of sending his nephews to the Philadelphia area in order to buy a truck for his farm, and generously offered to have the nephews load and transport the windows back to Greenwood. “It was a miracle how we got them down here,” Father Plata said. St. Bede Parish has completed its $4.5 million renovation project, and rededicated its new church. The relics, statues, paintings and stained glass windows from Most Blessed Sacrament are a testament to the idea of reusing in order to renovate. Because of the economic realities in Greenwood, most of the renovations at St. Francis Church were performed with the help of parishioners. Everybody got into the act, including Father Stoudt, who helped with the rewiring. All told, the renovations at St. Francis cost $31,000. “You can’t even remodel a kitchen for that,” Father Plata quipped. The reused windows from St. Bede’s now shine a lovely light inside St. Francis Church. Every time he looks at them, Father Plata is reminded of the generosity of a religious community many miles away. With his parents still living in the Philadelphia area, Father Plata plans to ask Msgr. Marine if he can celebrate Mass on a Sunday when he visits this summer to speak to the St. Bede flock. Thank you for such an up-lifting article and nicely written. Best wishes to both parishes and Patrick McNally, too!